As I've blogged before, I spent years fighting the Japanese national ID system, pushing for a 3 year moratorium on the bill to allow privacy and security to be fully considered before rolling the system out. Even though our movement had majority support among politicians, the public and even the media, the system rolled out "because it would have caused too much confusion to stop it," according to one senior policy oriented politician. Afterwards, I had a choice of either continuing to protest a running system from the outside, or work on the inside trying to point out issues and watch over the deployment. I ended up on various government oversight committees where I have continued to point out issues and still argue that they should shut the current system down. To my surprise, my hometown Mizusawa has the second highest proliferation of the national ID cards at 10% and hosted our Ministry of Internal Affairs and Communications study group today. As the local government officials discussed their system proudly, I felt some pain as I pointed out some of the risks. They knew that I was local so they asked my support for their initiative in that local family style... Scenes from The Godfather cross my mind. It reminded me a bit of the scene in Godfather II during Michael Corleone's trial where they bring the brother of key witness Pentangeli from Sicily to the hearing. All it takes is one look from the brother to change the Pentangeli's position. OK. It's wasn't that bad, but it reminds me of the same thing. My family has been building and running schools in the town for the last three generations and we just rebuilt our nurse school, which at some point I will have to "run". Until recently, our family funded the schools, but now relies partially on government support. As with most semi-public endeavors in small towns, it requires "community support." Thus The Godfather reference above. After the study group meeting at City Hall, I visited our family grave. I took a look at where my name will at some point be etched as the 19th family head of the Ito family. I took the opportunity to grill my uncle a bit more about the specifics of our history since I'll be the custodian of this information at some point. I also had him collect up various family history documents. It appears that the first Ito, moved into our current home about 400 years ago and was some kind of union of a 25th descendent of Emperor Kanmu, the 50th Emperor (we're on #125 now), and Kawatari Fujiwara. I can't understand the old-fashioned Japanese text to understand the details of the arrangement. I believe Kawatari Fujiwara was from the Fujiwara family that lived in our region until they were defeated around 400 years ago. The only thing left from this period of the Fujiwara estate/castle is a golden pagoda and mummies in Hiraizumi. Anyway, the story I heard from my mother was that after their defeat, the survivors fled and started their own families in the region, and took the character "Fuji" from "Fujiwara" and changed their names to "Saito", "Goto" and "Ito" which all use "Fuji" character for the "To" part of the names. Anyway, I'm not positive about the details so I better find out more before I have to take over the family and my children start asking me all kinds of questions. As always, staring at the place on the gravestone where my name will be etched along with all of the previous family members makes me feel like a mere blip in history and is humbling and strange. Fascinating. Both parts of this post. Must be an odd experience to look at your own grave, not something many Westerners will ever do that's for sure. Many people think that it's morbid and depressing to picture yourself on your deathbed, or to think of how things will be after you're gone - but it's not. When you confront your own death, you're reminded that your journey is not without end, but a finite line from point A to point B. We all talk about doing great things 'tomorrow' and 'achieving goals eventually' - putting yourself in the frame of mind you'd be in at your death leads to a paradox that energizes you into action now. I particularly enjoyed your grave comments. Thank you for sharing them with us. Matteo: It's not really a choice at this point. The comments about your family history and your family grave are quite interesting from the point of view of one who has been surrounded by American culture for all of his life. I am impressed with the amount of family history that has been recorded and passed down. Even the grave itself carries more history than I know about my own family. joi, i understand-- i suppose it is lucky that we live in a world now where one can at least combine ones preferences with the traditions. i attended a funeral in japan once, and was amazed by how sophisticated the rituals were, in terms of keeping people extremely occupied but at the same time, involved with their community. in any case, i was sort of teasing you about objecting to having your name on a national id card, but being ok with having your name on your ancient family grave. i suppose thats why you wrote the combined post, though. Thanks for the nice post. Your candor is appretiated. I guess you did "o-hakko maeri" while you were there? Im headed to Aichi later this month to do that (I'm "mukoyoshi"). Ever see Itami Juzo's "The Funeral"? Very funny movie. Chris B: Thanks. Yes, I love all things Itami Juzo. I actually had dinner with him a week or so before he "committed suicide." Joi: You seem to be very fortunate in terms of making connections with interesting people. But yes... I've been very fortunate and lucky with meeting people, often quite randomly. These kind of post are the ones why I like reading your blog Joi. 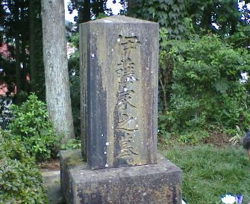 As for peoples comment regarding family graves... That is not something only the Japanese did, it is customary with large rich western families to have a family grave or tomb. As a 100% donor I never thought about being buried. Listed below are links to blogs that reference this entry: National IDs and gravestones. Joi Ito - "National IDs and gravestones" by Joi Ito is licensed under a Creative Commons Attribution 4.0 International License.